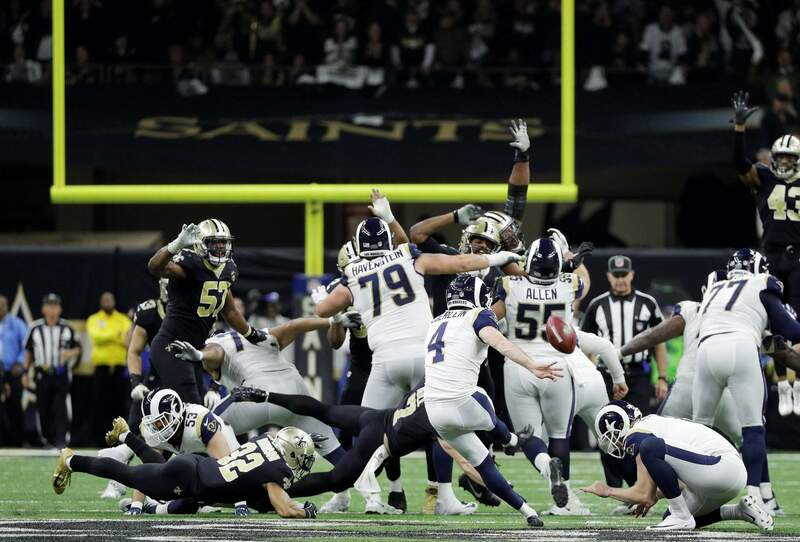 Los Angeles Rams kicker Greg Zuerlein kicks the game-winning field goal in overtime of the NFC championship game against the New Orleans Saints on Sunday in New Orleans. 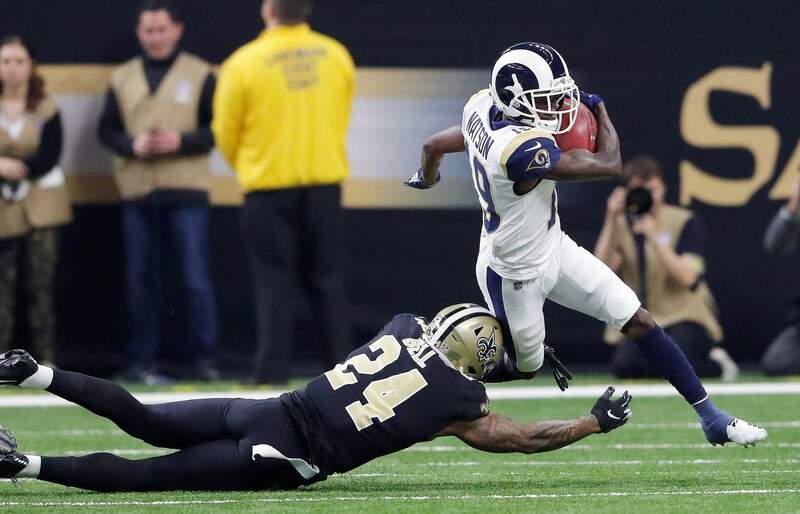 New Orleans Saints wide receiver Tommylee Lewis works for a coach against Los Angeles Rams defensive back Nickell Robey-Coleman during the second half of the NFC championship game Sunday in New Orleans. The Rams won 26-23. 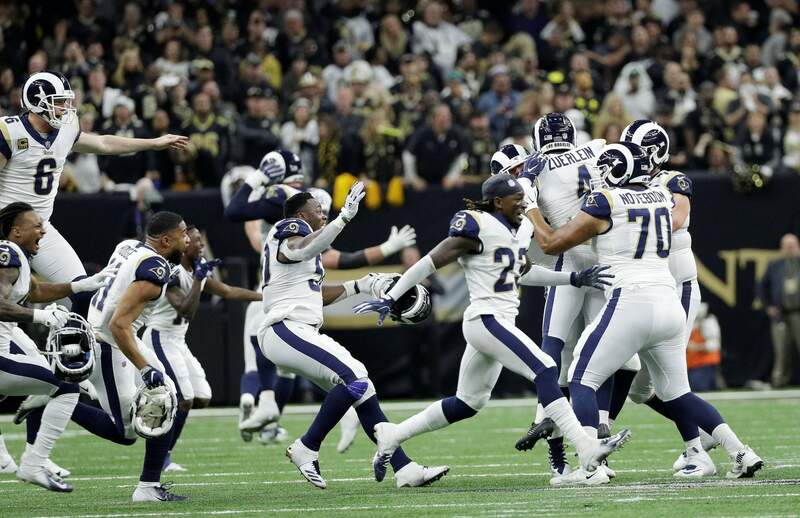 Los Angeles Rams players celebrate after overtime of the NFC championship game against the New Orleans Saints on Sunday in New Orleans. 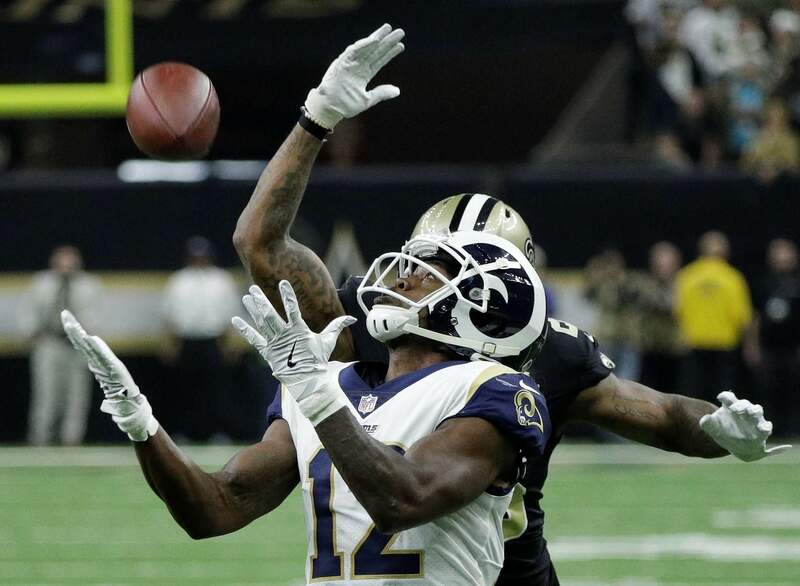 Los Angeles Rams wide receiver Brandin Cooks prepares to make a catch ahead of New Orleans Saints cornerback P.J. Williams during the first half of the NFC championship game on Sunday in New Orleans. 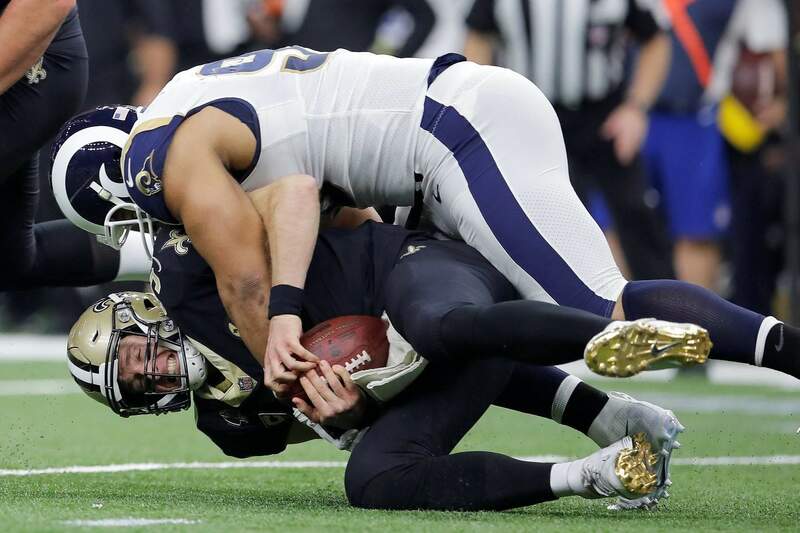 New Orleans Saints’ Drew Brees is sacked by Los Angeles Rams’ Ndamukong Suh during the first half of the NFC championship game on Sunday in New Orleans. 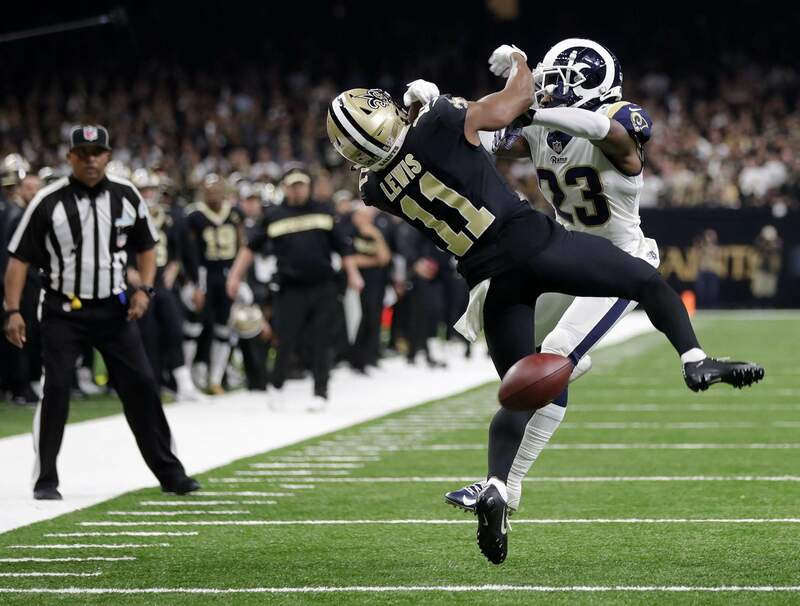 Los Angeles Rams’ JoJo Natson tries to get past New Orleans Saints’ Vonn Bell during the first half of the NFC championship game on Sunday in New Orleans. 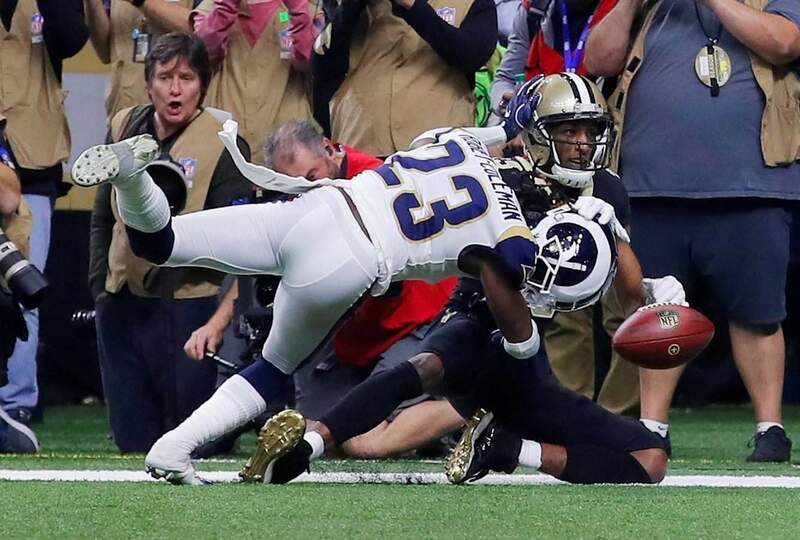 Los Angeles Rams’ Nickell Robey-Coleman breaks up a pass intended for New Orleans Saints’ Michael Thomas during the second half of the NFC championship game on Sunday in New Orleans. 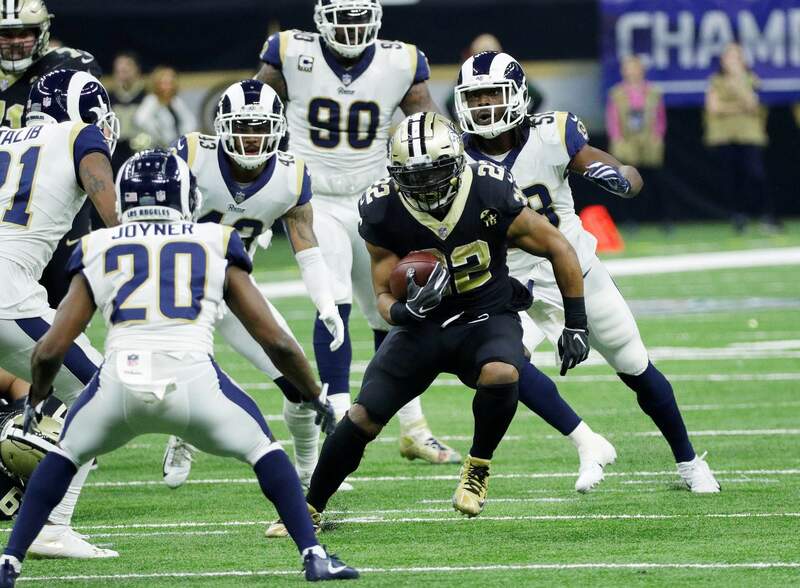 New Orleans Saints’ Mark Ingram runs during the second half of the NFC championship game against the Los Angeles Rams on Sunday in New Orleans. NEW ORLEANS – A big comeback. A blown call. And, finally, a booming kick that sent the Los Angeles Rams to the Super Bowl. BREES’ FUTUREThe 40-year-old Brees made it clear he’s got no plans to retire. INJURY REPORTThe Saints lost tight end Josh Hill to a concussion in the first quarter. UP NEXTThe Rams head to Atlanta in about a week for the Feb. 3 Super Bowl at Mercedes-Benz Stadium. They will face either the Kansas City Chiefs or the New England Patriots, who met Sunday night for the AFC title.